HELMHOLTZ, HERMANN VON. 1821-1894. Chemnitz: Max Kohl, c.1905. A wood and brass sound synthesizer built by Max Kohl after the design by Hemholtz. 39½ x 29 inch mahogany base with turned feet, fitted with 11 small wooden platforms, each marked with a number and the words “aus” [from] and “ein” [to], 10 of the platforms fitted with tuning forks and accompanying brass Helmholtz resonators, the tallest measuring 18½ high, each pair ranging in size according to their graduating frequencies, 11th platform fitted with 1 large horizontal master tuning fork. All 11 platforms connected together with wire filaments, which are in turn attached to a keyboard fitted with 10 African ivory keys, each numbered and marked with the tones ut [Do, or C] to 4 octaves, mi [E] to 3 octaves, and sol [G] to 3 octaves. Each key is paired with 2 brass knobs, one each on the wooden panel above the key, and one each on the panel below. Opposite end from keyboard fitted with 2 anodes and 2 cathodes, each with accompanying brass knob. 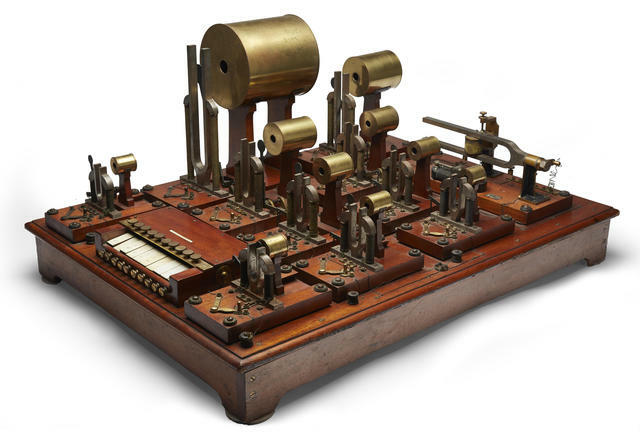 The Helmholtz sound synthesizer was the first electric keyboard. Specimens of these are extremely rare, with only one similar but smaller apparatus located in a US institution that we know of. We have not seen another as large or finely made as this one. The synthesizer was used to combine timbres of 10 harmonics to form various vowel sounds. The system is driven by an intermittent current provided by a large horizontal master tuning fork on numbered wood base, and was operated by pressing on the various keys which sent the current to the corresponding electrically driven tuning forks. These forks, fitted with Helmholtz resonators tuned to the same frequency, would then reproduce the desired tone. Helmholtz invented his resonator to identify the various frequencies of the pure sine wave components of complex sounds containing multiple tones, showing that the different combinations made could reproduce vowel sounds. Max Kohl of Chemnitz is perhaps one of the most famous scientific instrument makers of the late 19th and early 20th centuries. His work was distinguished by its exacting craftsmanship, and high quality materials. A documentary about Japanese Video Game Music! WFMU on Twitter hipped me to these insanely cool photos of psychedelic electronic music group Silver Apples’ homemade electronic gear. Holy hell these are great!